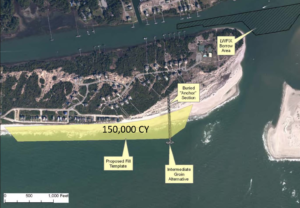 The attached material provides the basis for this position, and includes the resolution that was passed by the HBPOA members during their meeting on March 31st urging the Board of Commissioners to continue with the same nourishment and Lockwood Folly inlet strategies from the last 15 years, and to stop spending the Town’s money and resources in pursuit of a terminal groin. The Corps of Engineers, Wilmington District will receive written comments pertaining to the proposed groin until 5 PM, April 16, 2018. Comments should be submitted to Mr. Mickey Sugg, Wilmington Regulatory Field Office, 69 Darlington Avenue, Wilmington, North Carolina 28403, (910) 251-4811. HBPOA has requested an additional 30 days for comments, but it is not clear that the extra time will be granted. Visit our Terminal Groin Page to learn more about the proposed groin. What is the basis for the HBPOA declare or imply that this determination is the position of the entire membership? Was a count of the question made? If so, what was it? The resolution was passed by a Board vote of 9-1 and a membership vote of 21-7 at our meeting on March 31, 2018.